In Dungeon 192 there is an adventure called “Going Ape!” which could for the most part be used whole cloth in Maztica. In down time between projects I am thinking of converting it to 5e. If you have run the adventure (I haven’t), could you share any of your thoughts on it? Do you think it is a good fit? Where exactly might you locate it? There is an ancient kingdom referred to (though it seems quite small) in the jungle and whom might these folk be? The Green Folk perhaps? Also, if I were to do a full update, or perhaps a sequel even, what could be added? Well, using apes in a Mesoamerican setting seems weird... but these could be easily reflavored into giant/dire version of New World Monkeys. 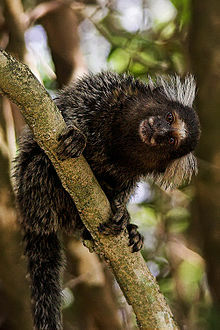 Why not have the PCs getting mauled by Dire Marmosets? Also, I know it's traditional - but why does it always have to be the chieftain's daughter who gets kidnapped? Why not the chieftain's son instead? Well, while I'm with Jurgen about the overused cliché, in the story it is consistent (the gorillas believe the girl is the reincarnation of the old queen of Cihuatlco, because the girl got some jewel that had embedded the last remains of the queen's psyche—it would be fun if the son had the queen's psychic remains, though). I prepared the adventure, but never actually played it. My players chose the other route (I'm not good at railroading, so I have a few options prepared for such events). I guess is a good fit, because is so points of light, that you can drop it to your campaing if you want, and needs no changes (or a few cosmetic changes) to work. I have few knowledge about ancient Maztica, but the kingdom is already destroyed by the start of the adventure, so is of little consecuence to the actual story.